Aimpoint Wins U.S. Army Optic Contract! You are here: Home / Optics / Aimpoint Wins U.S. Army Optic Contract! 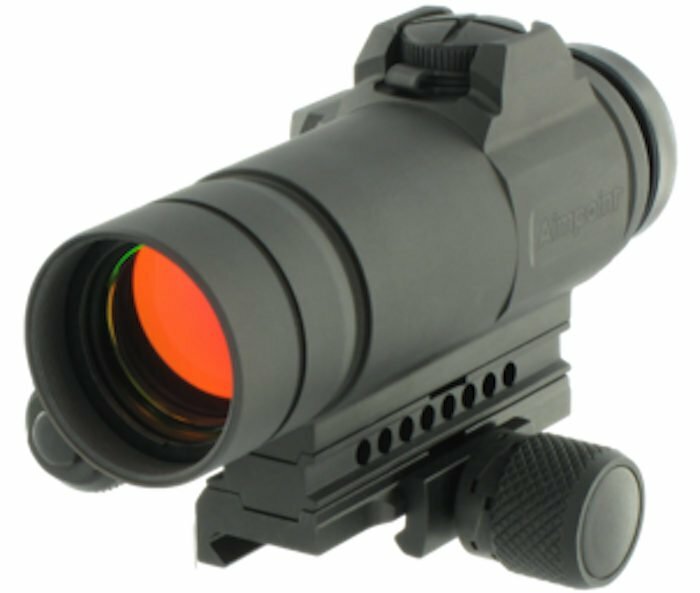 The Aimpoint® CompM4s optic is an excellent choice for a military optic. Aimpoint® has just announced the company has been awarded another highly lucrative contract to supply the U.S. Army with 30,000 M68 Close Combat Optics (M68CCO). The Aimpoint CompM4s optic has been selected to be type-classified as the M68CCO for use in the U.S. Army and U.S. Air Force. This announcement is incredible news for the iconic red dot optic manufacturer, and a continuation of Aimpoint’s service to U.S. troops. Aimpoint has been widely regarded as one of the best red dot/reflex optic manufacturers in the world, getting the red dot optic selection started way back in 1974. In comparison, Trijicon did not arrive on scene until 1981 and EOTech is a relative newcomer starting in 1995. The Aimpoint optics have proven to be accurate, durable, simple to sight, and providing some of the longest lasting battery life in the industry. The Aimpoint M68CCO is suited well for military or law enforcement use. The Aimpoint® CompM4s optic is an excellent choice to add to the U.S. Army’s rifle optic selection. The CompM4s is one of three options in the CompM4 series of optics, and Aimpoint claims they are the best sights they have ever produced. The first CompM4 optic came out in 1995, the same year competitor EOTech was just getting started. After over 20 years, Aimpoint has provided over 1 million optics to the U.S. Military. Improvements from previous Aimpoint optics include an improved energy-efficient design providing up to 8 years of continuous use from a single AA battery! YES! That’s up to 8 years of continuous “on” use from the CompM4s, from a single AA battery. Officially Aimpoint claims around 500,000 hours on NVD settings, and 80,000 hours on day settings, but hey, who’s counting! It just does not get better than that – not even close! Both in longevity and cost of battery, this Aimpoint far outshines the competition. The M68OCC has a very low battery compartment, instead of the top battery compartment on the original CompM4s. This is perfect for military and law enforcement applications as it provides a broader field of vision in the peripheral during 2-eye open shooting. This is the only difference in the optics, according to Aimpoint. Even with the lower battery compartment this Aimpoint optic reaps huge benefits for the shooter. Considering the potential 8-year battery life span, I don’t even give battery compartment location a second thought or concern. The M68OCC, like all of Aimpoint’s CompM4 sights, have been “soldier-tested and combat-proven.” Aimpoint makes outstanding optics capable of withstanding the harshest conditions and treatment by the end-user and elements. 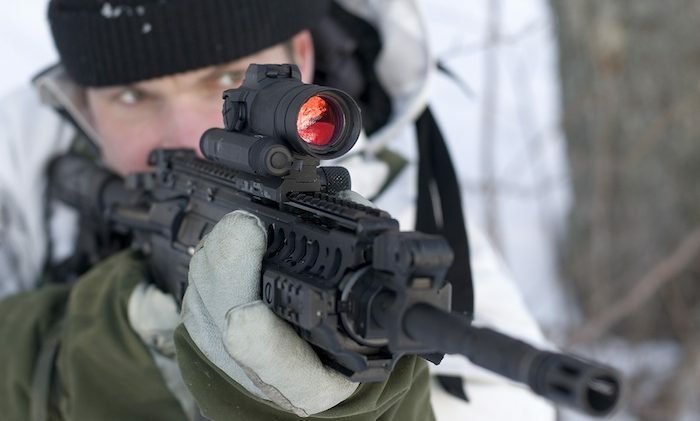 Aimpoint® CompM4s series optics are standard infantry soldier sights in many NATO countries. 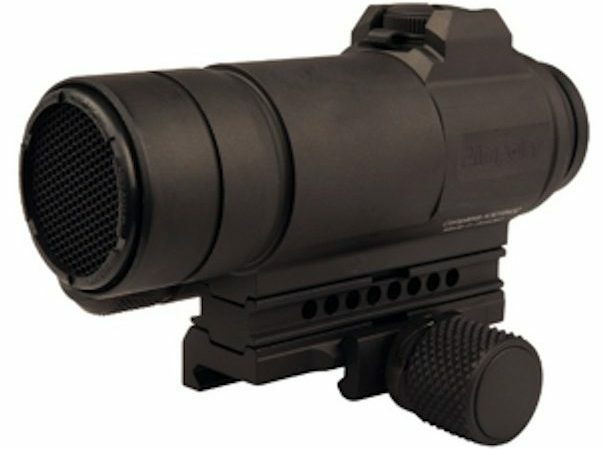 Aimpoint includes the killFlash® anti-reflection device on each M68OCC, as well as rubber lens covers, a QRP2 mount, and a standard AR-15 spacer. The QRP2 mount is touted as having twice the torque retention as the original QRP mount, and comes with a larger tightening knob for easy application or dismount. Mount based keyed into sight to absorb recoil. The Aimpoint M68CCO is getting more work as an Army rifle optic. Temperature Range: -49F to 160F. Aimpoint optics are outstanding. There is a reason they continue to be a world leader, and anyone looking for a serious reflex optic should be considering Aimpoint options. Some people do not prefer a simple dot, and I get that. I used an EOTech optic for nearly 10 years, and came to appreciate the outer ring and its aiming points. However, for close combat situations a dot is both simple and fast. The Aimpoint M68CCO will have a (2) MOA dot which is my favorite size for red dot. With a (2) MOA dot the shooter has a clear and bright enough dot to make very fast sight pictures and targeting for close-range shots. The dot is also not too big to overly cover a target at distance. Anything larger and you really lose accuracy of aiming point even at 100 yards. A (1) MOA dot can be very nice, but I have typically found the need to dial the dot up to very high brightness settings during day shooting to provide the quickest recognizable aiming point. In most optics that means a serious battery drain. The U.S. Army will do well with the M68CCO optics, but I do not expect the Aimpoints to completely take over infantry rifle optics. These optics will most likely be given to the basic infantry soldier, while the Trijicon ACOG and other magnified optics will continue to find service with unit Designated Marksmen and even as M4 mounts for snipers. Editor’s Note: This press released was received 03/22/17 at 1004 hours. Manassas, VA – March 22, 2017 – Aimpoint, the worldwide leader in reflex sight technology, has been awarded a contract for supply of 30,000 M68 Close Combat Optics (M68CCO) to the U.S. Army. The Aimpoint CompM4s sight is type-classified as the M68CCO when used by the U.S. Army and U.S. Air Force. These sights will be supplied with a killFlash® anti-reflection device, rubber lens covers, and adapters which allow the sights to be deployed on all versions of the M16 rifle, M4 Carbine, and light machine guns such as the M240 and M249. Aimpoint produces a complete line of high quality reflex sights for use by military, law enforcement, hunters, and sport shooters. The company also produces electronic fire control systems for use on crew-served weapons. For more information on Aimpoint products, please visit the company’s webpage: www.aimpoint.com.